Are ‘pasta’ and ‘gluten-free’ compatible? Yes! 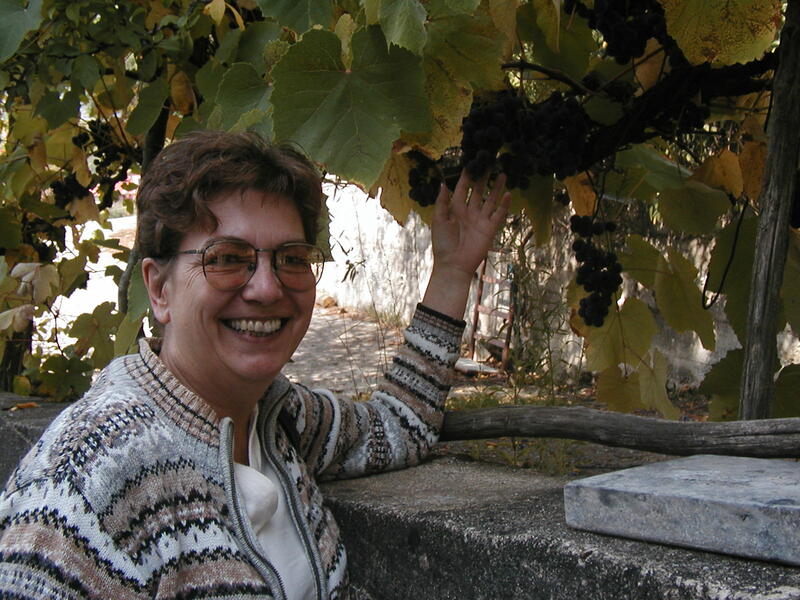 Marlie Johnson, 2004, in Calabria. One of the best things about being part of a family with Italian roots has to be the food. Pasta, pizza, pastries! These have been staples on the table my entire life… until about a year ago. I was diagnosed with an allergy to wheat! That explained a lot of problems I had been having, but it also caused havoc with my diet. After a lot of research, I decided it was easier to go gluten free than try to avoid just wheat. Then I found that gluten free is not the tastiest. I found a few gluten free pastas, but they didn’t taste very good. I was very surprised when I found two companies in Italy who were making gluten free pasta, and it is good! They are Delallo and Barilla. Between the two, there is a great variety of pasta, including penne, spaghetti, orzo, shells, and fusilli – these are the ones I have found so far. The most important lesson I have learned for cooking gluten free pasta is to not overcook it AT ALL. It will turn to mush. If you are going to add the pasta to a sauce and bake it, then stop cooking it about a minute before the directions for al dente – it will finish cooking while baking, and be perfect. Here is a recipe that I have used gluten free penne in, and it turned out great. I had it “taste tested” by people who only eat gluten free, and several who eat anything! They all said it was really good, and asked when I was going to make it again. 1/2 cup grated Asiago 1/2 med. yellow onion, chopped. Preheat oven to 350 F. Bring a large pot of lightly salted water to a boil, and cook pasta until almost tender, about 10 minutes. Cook the sausage in a large skillet over medium heat, turning frequently, until cooked through. Remove from skillet, cool, and cut into slices. Add the garlic, fennel and onion to the skillet and season with salt and pepper. Cook for about 5 minutes, then add the roasted red peppers, basil and sausage and the marinara sauce. Heat through over low heat until warmed. Combine the pasta with the sauce and vegetables in a 9 x 13 baking pan. Spread the cheeses on top. Garnish with a few fennel leaves. Cover with foil and bake for 30 minutes, then remove the foil and broil for 5 minutes, or until the cheese is lightly browned. I used bulk sausage instead of links. I used Barilla Gluten Free Penne Pasta, and cooked it one minute less than the package called for al dente. I cooked the vegetable for about 10 -12 minutes, until the fennel was almost fully cooked. …. and ready to eat! Would I change anything else the next time I make it? I would try it with sweet Italian sausage, or an equal mix of hot and mild. It had great flavor, but it was spicy hot! For me this one is a keeper, and I will make it gluten free for everyone who is coming to dinner! Serve with salad, or a green vegetable, garlic bread and your favorite wine. Watch salad dressings for gluten…it hides in all kinds of condiments! You can make croutons and garlic bread from gluten free bread. Rudi’s brand bread is the best I have found. It is good for French toast ….if you want to send your taste buds a little farther north in Europe! 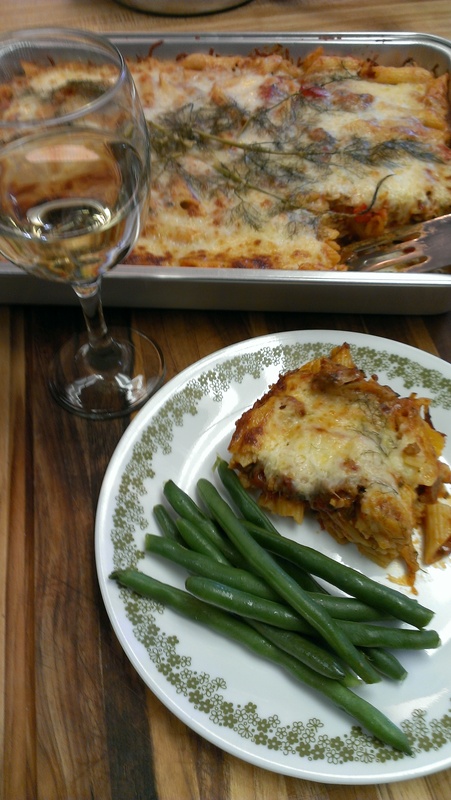 This entry was posted in Food and tagged baked penne, cooking, food, gluten free, pasta. Bookmark the permalink. ← Ricotta-Almond Cake: Make it. Eat it. Die happy. Whenever I read this blog I’m glad to be me! I know Marlie was very happy to find pasta that she can live with! 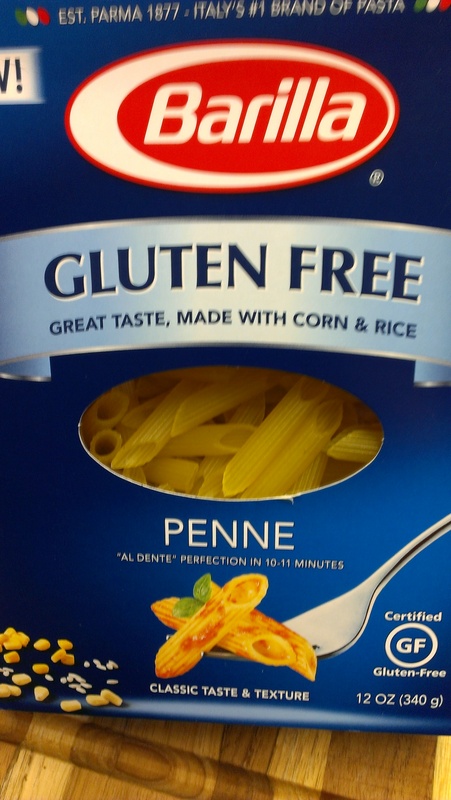 I was so happy to find the gluten free pasta made in Italy! I have worried that if I get back to Italy again, I wouldn’t be able to enjoy the food… not so much any more! Hats off to Peppino, and to you for bringing your sister some great pasta! By Jove (who is that Jove, anyway?) I do believe I’ve raised a bunch of gourmet cooks!! I’m glad you suggested using sweet Italian sausage, Marlie, because that was the first change that crossed my mind. Hope I can make this soon, but I will first create my own marinara sauce of course! Thanks to my daughters who provided this one. Mom, I just took some sweet Italian sausage out of the freezer, and am going to try it tonight! i will let you know how it tastes. It was REALLY good Mom, I will eat it anytime you want to make it for me! Thank you, Don! I will make it again when you are home again! Cool beans!! And pasta. Fratelli 4 life! Dyana, I think your family would really like this! 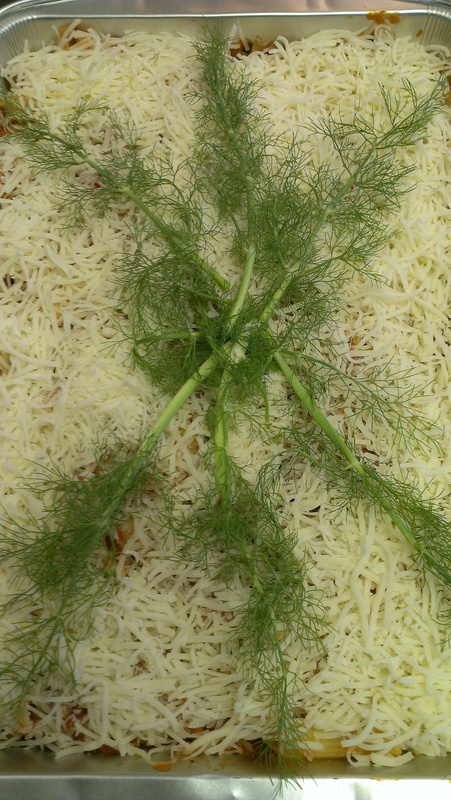 The fennel doesn’t overwhelm it, so the kids wouldn’t even know it’s there!